Occasion : A Summer holiday with a difference. Location : To Iceland by boat, with Northern Light. 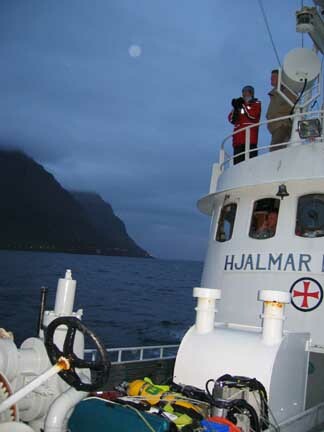 Boat details : Hjalmar Bjorge, an ex-Norwegian Fishery support vessel, now fitted for offshore cruising. The Weather : Who said Iceland was cold? Bright sun was the order the day, but with a cool, greyish end to our time amongst the Fjords of the North west. The sea mist that settled in as we crossed from Raufarhofn held firm as we motored west and then south across Oxarfjordur and into Husavik Bay. Navigation by gps and radar kept us on track, On the way we passed several local fishing boats and later on, the whale-watching boats sailing out from Husavik. 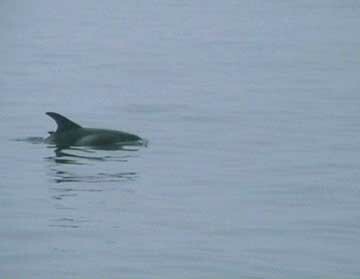 We had several sightings of dolphins.as we crossed the bay, helped by the flat calm sea. 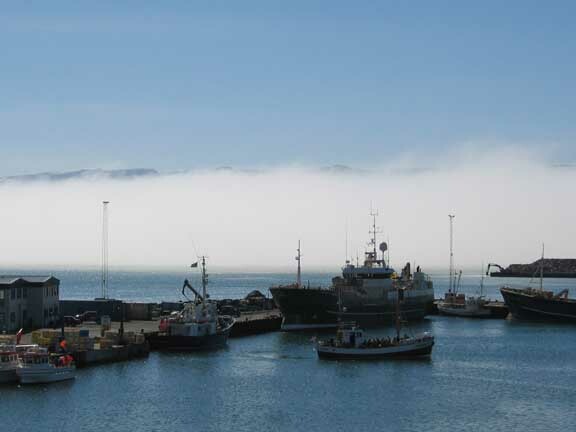 The mist finally cleared as Mark brought us into harbour at Husavik itself. Hjalmar Bjorge (centre left) safely berthed. Behind, the sea mist that had obscured visibility on our journey across the bay. 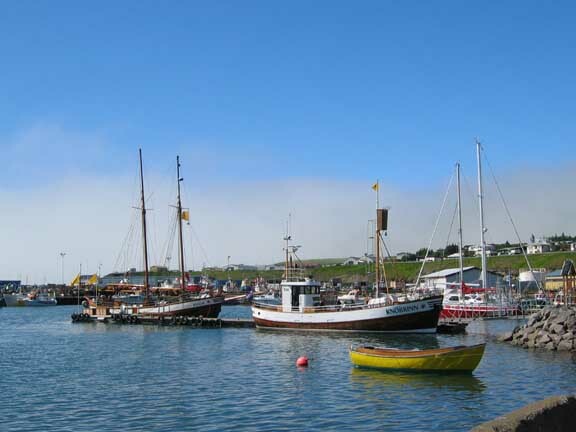 Husavik, a delightful town and regional centre. 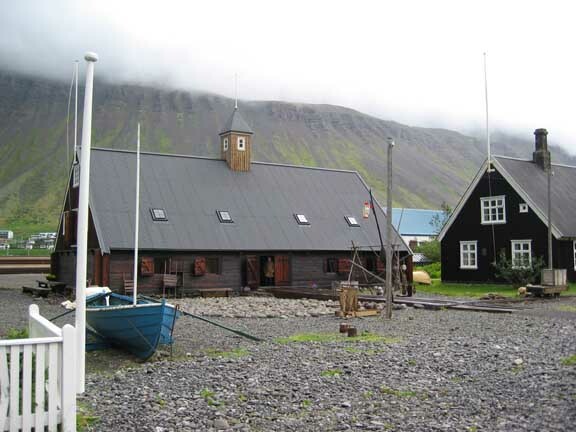 Opposite is the local Icelandic Lutheran Church and all around the moorings of large and small craft, and the paraphinalia of a busy little sea port. 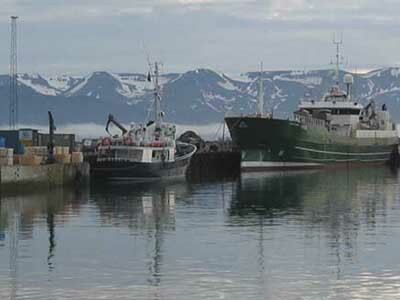 Husavik is renowned as the Whale Watching centre of the north. Two of their four boats were moored here against the pontoon, and one or other of their boats were always on the go, taking people out into the bay to try and view the wildlife for which the region was famous. 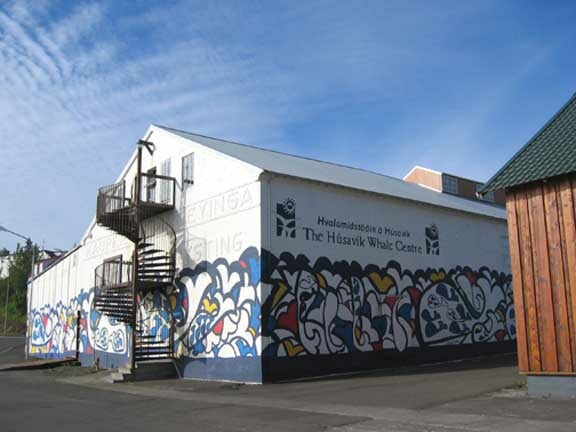 The area, though apparently not this port itself, has a history of Whaling, and one of the local harbour buildings had been recently converted into a Whaling Museum. 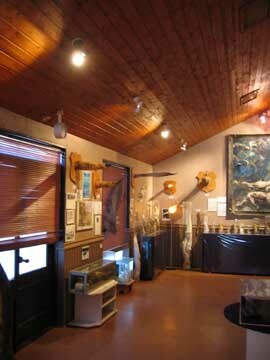 It has old artifacts, bones and film footage, but concentrates on presenting a modern, conservation based approach to whales and tourism. 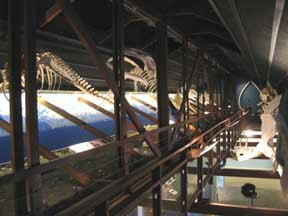 and static and video presentations fill in the detail. 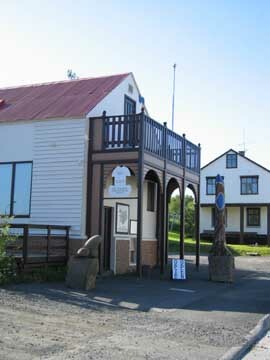 Husavik has two other museums, a cultural heritage centre, and this one, the Phallological Museum of Iceland. Well, as the curator said, someone somewhere had to do it ! We spent two night at Husavik and with a bit of rapid planning we hired two cars for the intermediate day. 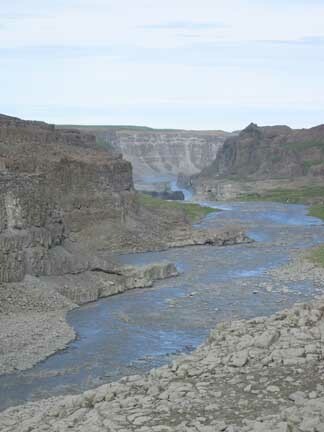 This allowed ten of us to venture into the interior to see the land-based sights of Iceland. Not a car breakdown, but a road repair ! Metalled roads gave way to dirt roads as we ventured south. At one point we drove up behind a tipper lorry who proceeded to stop in front of us and disgorge its load blocking the way forward. 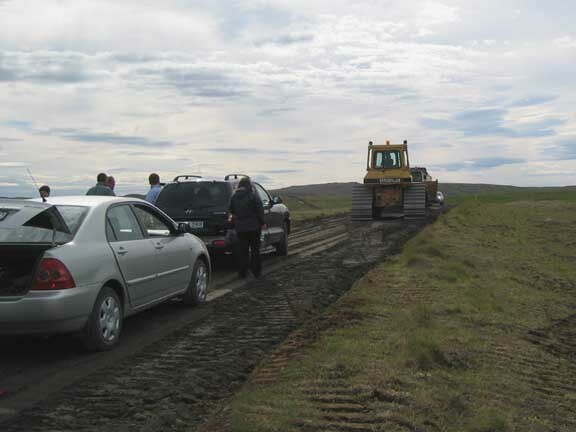 Very quickly a large bulldozer drove up and levelled the new surface and we progressed on our way. How refreshing NOT to have traffic lights. 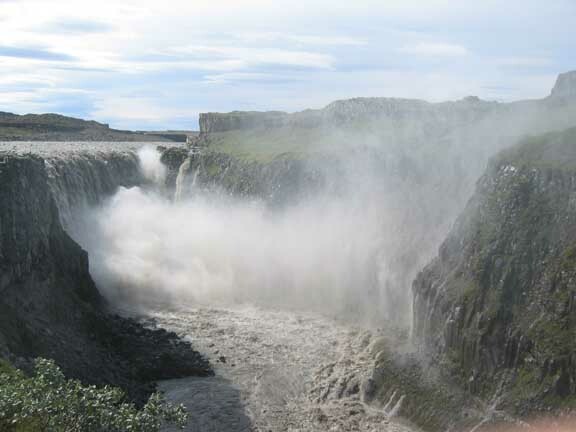 Dettifoss - our first objective. 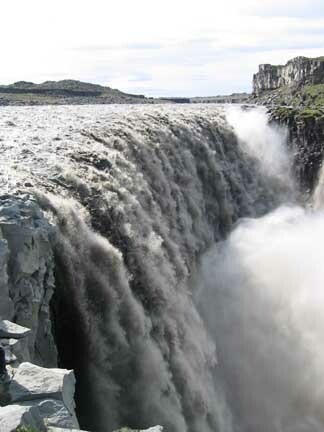 Iceland is famous for its waterfalls, and none more so than this one. 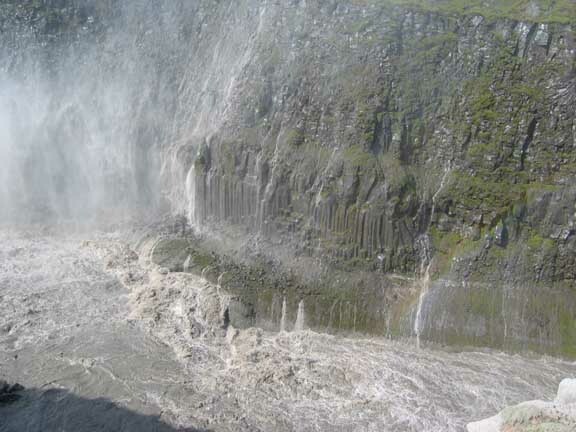 The river flowing from the central glaciers has carved a deep valley, known locally as the Jokulsa Gorge, and thick, muddy, glacial water crashes headlong over one major and two minor waterfalls, causing a spray cloud than can be seen from several miles away. 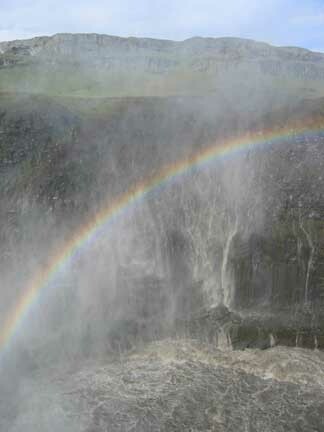 but carries the largest volume of water of any European waterfall. then falls into the raging torrent below. The half minute video should open and play in your own Windows Media Player. Note: It may take a minute or so to download on slower connection speeds - please be patient. 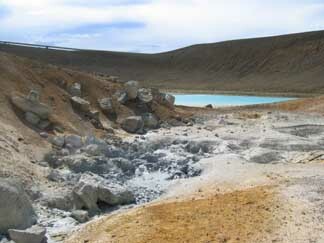 From there we motored on to the Krafla volcanic mountain region. 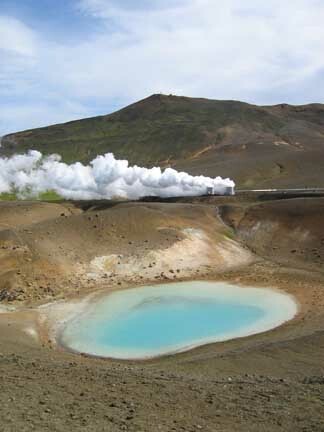 The mountain of Krafla in the hills south of Husavik is the remains of an active volcano created thousands of years ago. 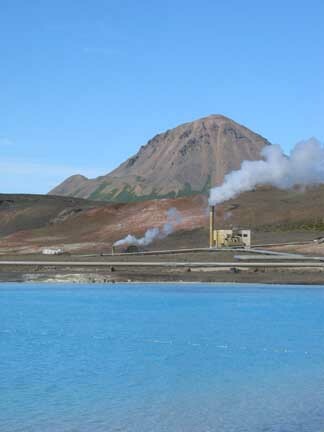 In recent years the locals have taken advantage of the geothermal energy ( heat ) by drilling boreholes, pumping in cold water and and extracting super-heated steam for power generation. 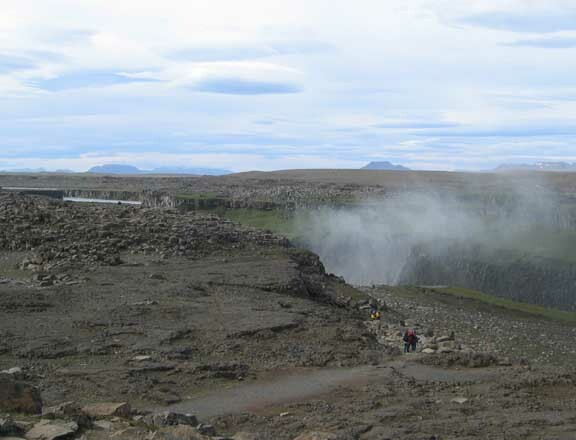 The White cloud in the picture is in fact unused steam venting from one of the boreholes. What is not evident from the picture is the continual sound it was making - like a roaring jet engine at take-off. Please click here or on the image for larger panorama images and information. 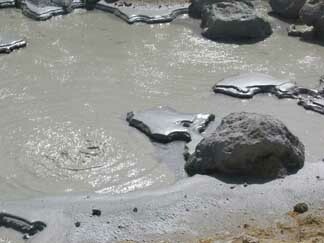 In what we thought was an inactive volcanic basin, we came across a series of hot springs and mud pools - amazing. 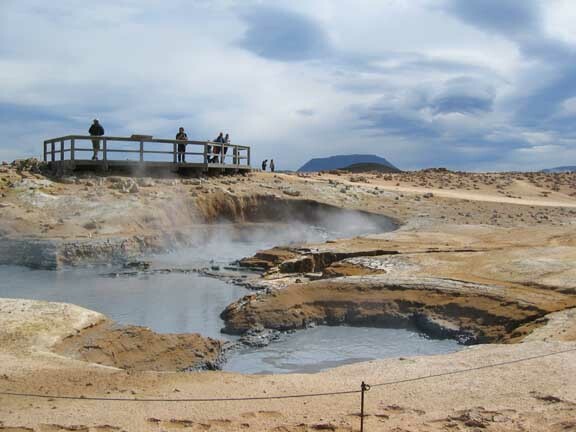 Back in the car, we crossed a short distance to the Namafjall geothermal area where the small fumaroles and mud pools of Krafla were outclassed by the impressive pools and sulphurous landscape of Namafjall. 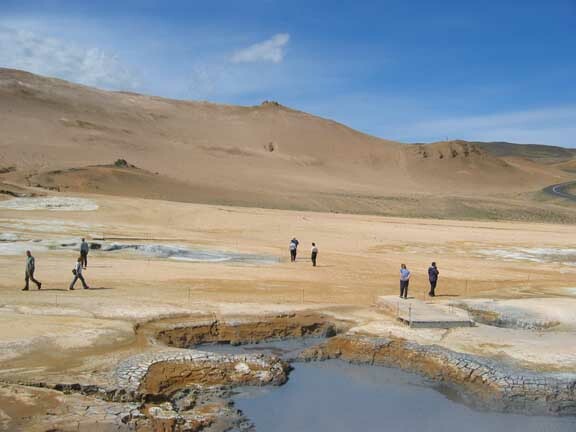 Boiling, bubbling mud pools - the people add an element of scale. One superlative was followed by another. 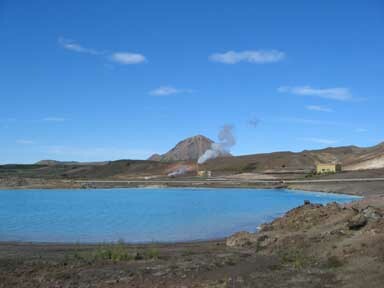 In the Myvatn region, another blue lake with its geothermal plant. Behind an impressive volcanic summit. Myvatn Lake, a lake in a not-so-old volcanic lava field. Apparently in the last twenty years or so this area has physically risen and fallen by over a metre as underground volcanic pressures changed. The shallow lake is an important wildlife area particularly for a large number of breeding birds. They thrive due to the abundant insect life. 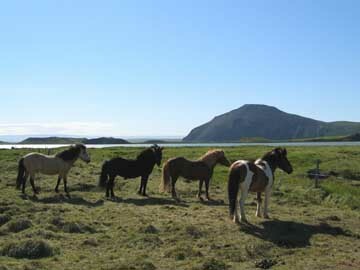 The translation of Myvatn in English is "Midge Lake"
As we drove round in search of the birds, we passed these Icelandic Horses on a local farm. 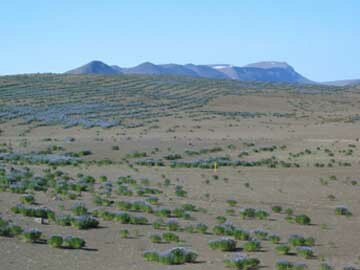 On the way back to Husavik we passed vast areas of lupins planted in an attempt to stabilise the barren ground. Next day we were off again on our last leg of the sea journey across the top of Iceland. Husavik Bay rewarded us with several sightings of dolphins but we were disappointed by a lack of significant sightings of other species. Rounding the north western headland of Hornstrandir. 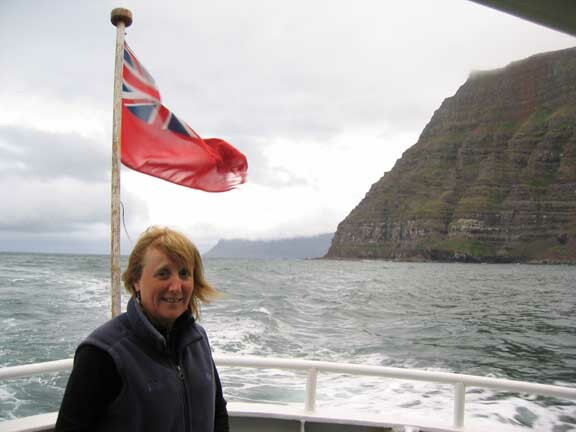 The the last section of our sea voyage was notable for clocking up 1000 nautical miles on Hjalmar Bjorge, and also for the sighting of a few more cetaceans, and that elusive iceberg mentioned on the radio a few days ago. By this time the burg was relatively small and we passed quietly north of it by several miles. 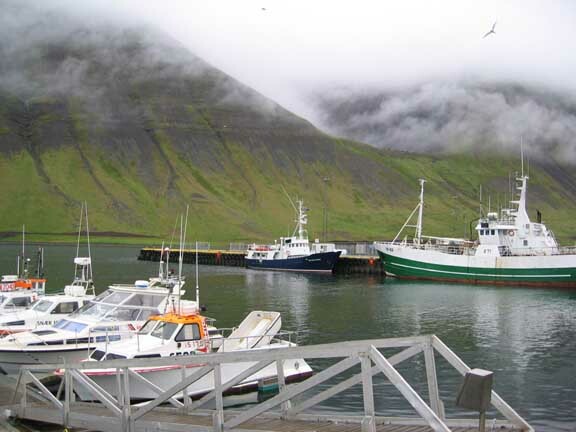 The latter part of the voyage was a little choppy with a strong northwesterly wind working against a northerly tidal flow, but the final turn into Isafjordur brought calmer seas. The photo is of very different midnight weather from that of Raufarhofn only a few days ago. We made our final port at 12.50 boat time (11.50 local time), after a nineteen hour crossing. 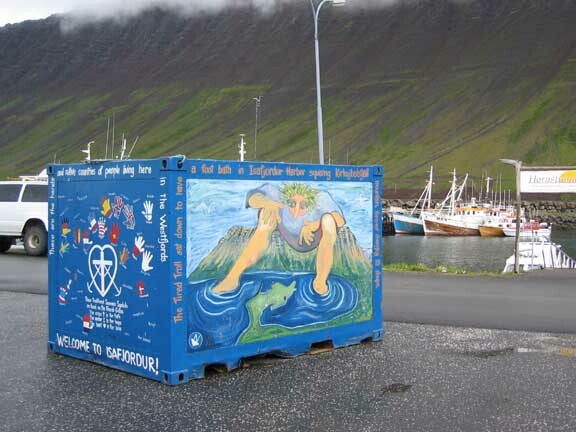 Local arts project and an unusual "Welcome to our town" painted shipping container. and appreciate the local buildings and sculptures. 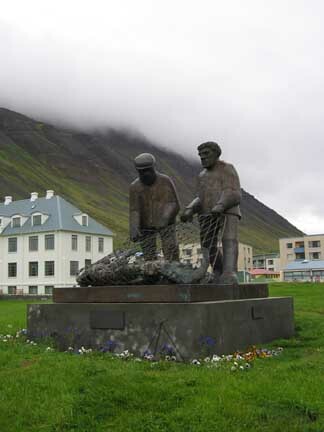 This was an excellent one depicting two Icelandic men gathering fish. 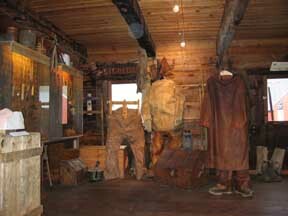 Isafjordur also has a long and rich fishing and trading history as portrayed in their local heritage museum. 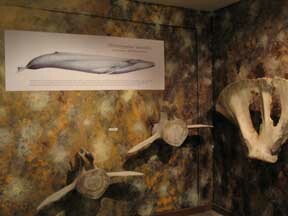 and included many excellent displays about the life of the region and its close association with the sea. 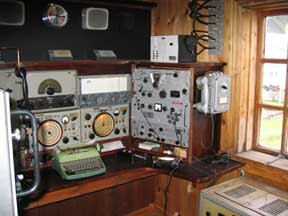 and a relatively modern Radio Room. 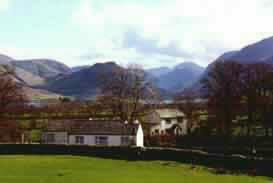 The town is built on a natural spit of land projecting out into the inner part of the fjord. The hills around would have been impressive if only the weather had cleared. Isafjordur marked the end of this Northern Light adventure to Iceland and Ann and I would like to thank Mark, Martin, Heather, Kirsty and Hannah (back home) for all their hard work in planning and completing the trip. A new group of guests would fly out and take our place for the return voyage and I'm sure they would experience an equally warm welcome and a great holiday adventure. All we had to do now was gather our belongings, pack our bags, and say goodbye to the crew and fellow passengers. 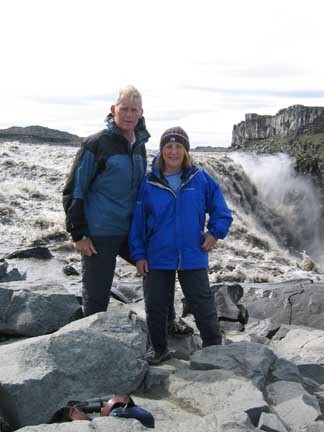 From here each of us had made our own arrangements to cross to Reykjavik and fly home. This was not quite the end of our holiday though , and our last few days in Iceland are highlighted on the final page. This site best viewed . . . with t-shirt and sunglasses (but a warm jacket for the sea mists).